For lunch today, Steve, Justin, and I headed over to the relatively new Japanese joint, 15 East. My best guess is it’s named after its address of 15 East 15th Street, but I’m not sure, I’ll have to research it. It opened in the space where Tocqueville was. Toqueville moved down the street and got a bigger space, and we got a great Japanese restaurant. Executive Chef Marco Moreira, who opened Tocqueville after training at Bouley Bakery, added Japanese to his repertoire and brought in Masato Shimizu, who previously cooked at Jewel Bako. The space is a simple white and gray, broken into two rooms. The first room is a sushi bar featuring African bubinga wood. The second room, a smallish dining room, offers nice acoustics and comfortable chairs. The menu is simple offering Japanese appetizers & entrees in one section and sushi & sashimi in a second. Lunch had a fixed price, five-course lunch for $75 and a three-course for $27. All three of us opted for the latter. It started with a clear broth soup, then followed with kakiage (a tempura sampler), and finished with a chirashi. The broth, while clear, had a strong flavor, slightly salted from the seaweed. Unfortunately the saltiness did not infuse in the fishball (which reminded me of gefilte fish, Passover coming soon and all). It also included one beautifully cut piece of bamboo, but bamboo doesn’t do much for me– to fibrous. 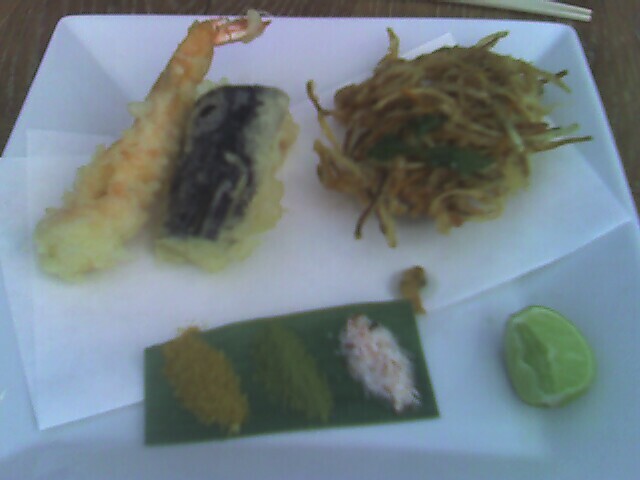 The kakiage includes tempura-fried shrimp, Japanese eggplant, lotus root, and a latke made of root vegetables and sweet onions and is accompanied by a lime wedge and three salts: curry salt, green tea salt, and togarashi salt. The tempura was oily — which it should never be — but otherwise crispy and hot. The lime was not strong enough against the oil and likely the classic ginger and daikon would’ve been better at cutting the oil. The salts were a wonderful addition, and worked well, although the green tea also struggled to stand up against the strong flavors. The real winner in this course was the latke. It was sweet due to onion and yam, it was crispy due to perfect frying, and presented as a beautiful nest. I really enjoyed it. The final course was a non-traditional chirashi. Typically, chirashi is a bed of seasoned, sushi rice with a chef’s selection of sashimi across the top. While some other restaurants, such as Hamachi, have alternative presentations most are pretty consistent. At 15 East, sweet pickled ginger pieces are mixed into the sushi rice. The tamago is a sweet egg custard, perfectly caramelized on one side and diced. 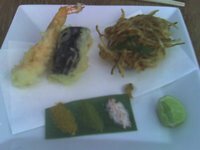 Other elements include sliced ebi (shrimp), diced snow pea, and slices of what I believe was saba (mackerel). 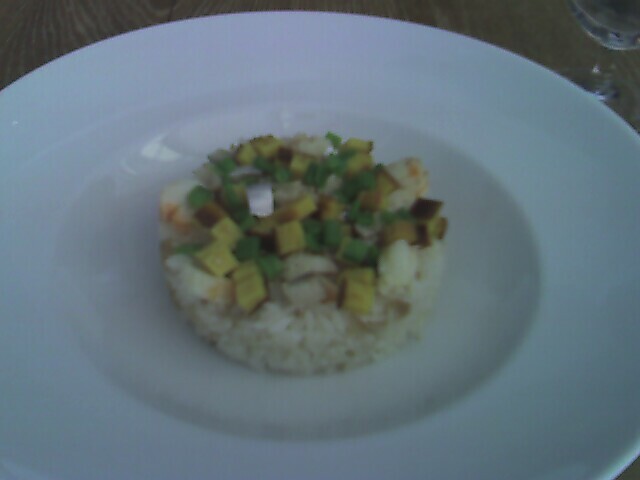 The taste was perfect, although the selection of seafood was less than impressive. The picture to the right doesn’t really give justice to the portion size, as the bowl is huge and the perspective is off. Justin didn’t finish his, and Steve wished he didn’t! The food was fresh and the service was stellar. At a table over from us, the wait staff poured a perfect, classic, glass and box of sake wine, and plated a tofu-based dish, although I couldn’t really see. The captain offered wonderful explanations of our dishes. And the prices were reasonable. The only true negative was the slightly-slow pacing. We waited slightly too long between courses, and exceptionally long for someone to check in on us after the third course was cleared. I highly recommend checking out 15 East. I will be back there, next time to focus on the sushi and sashimi. posted by Lon	at 10:23 PM	Filed under Miscellaneous. You can follow any responses to this entry through the RSS 2.0 feed. Both comments and pings are currently closed.